This week's Mystery Foto documented a historic event. -What event was this photo taken? Provide the date. 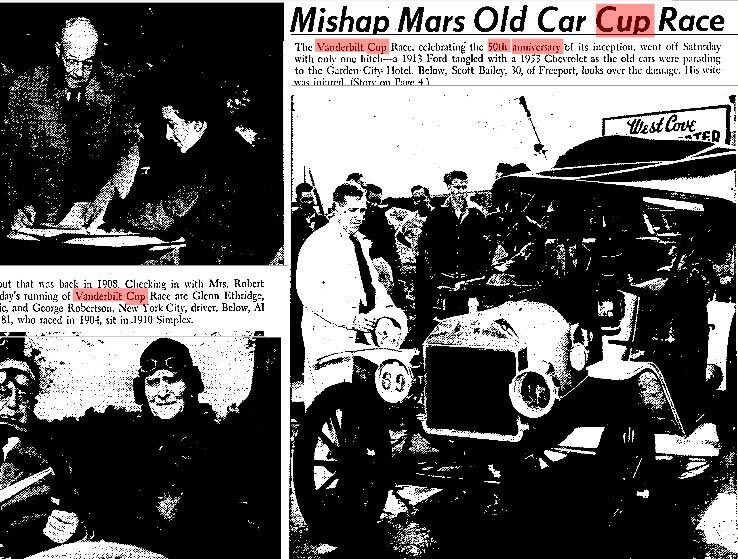 Considered by myself as the the greatest vintage automobile event ever held on Long Island, this photos was taken on October 9, 1954 at a celebration of the 50th anniversary of the first Vanderbilt Cup Race. 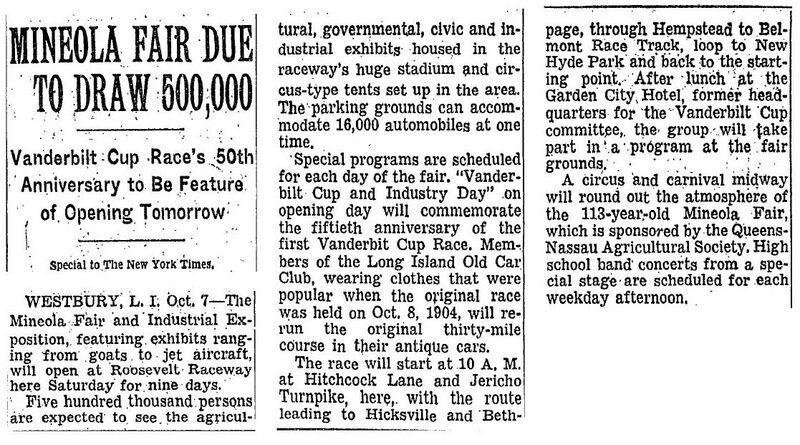 The event was organized by Long Island Old Car Club and the Mineola Fair and Industrial Exposition. 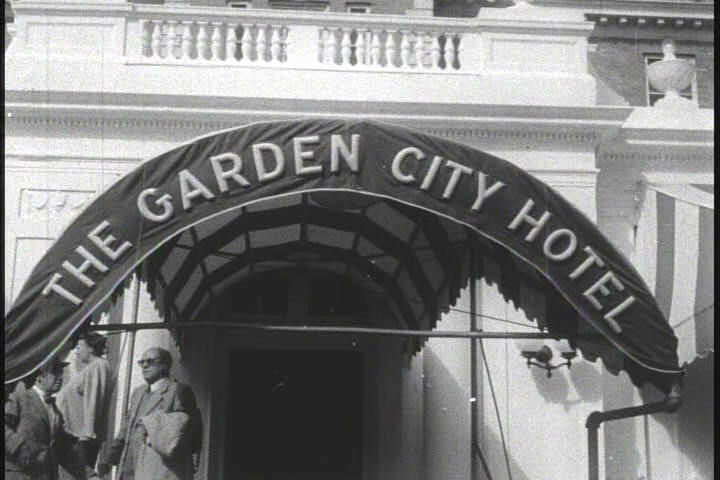 This photo was taken at the Garden City Hotel. -What is the significance of the photo? This was one of the last photos of George Robertson and Glenn Ethridge in Old 16. Robertson passed away seven months later. Congrats to Greg O., Art Kleiner, Steve Lucas, and Ariejan Bos for solving the Mystery Foto's driver, mechanician, car and event. Kudos to Art for forwarding the below additional news "Art"icles. 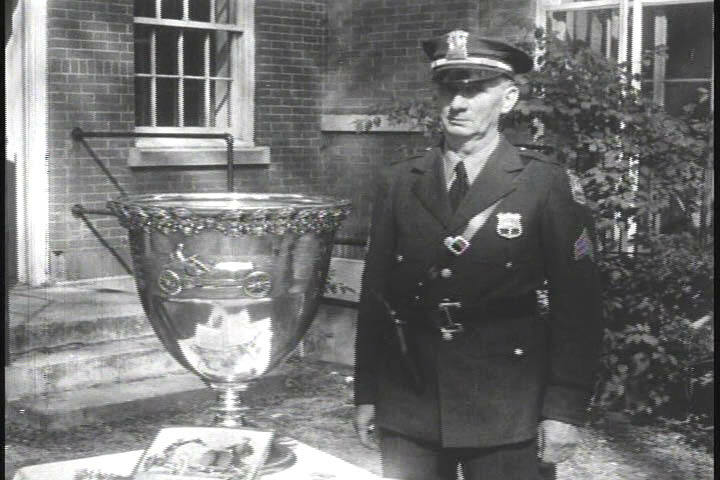 The Vanderbilt Cup trophy was part of the event. 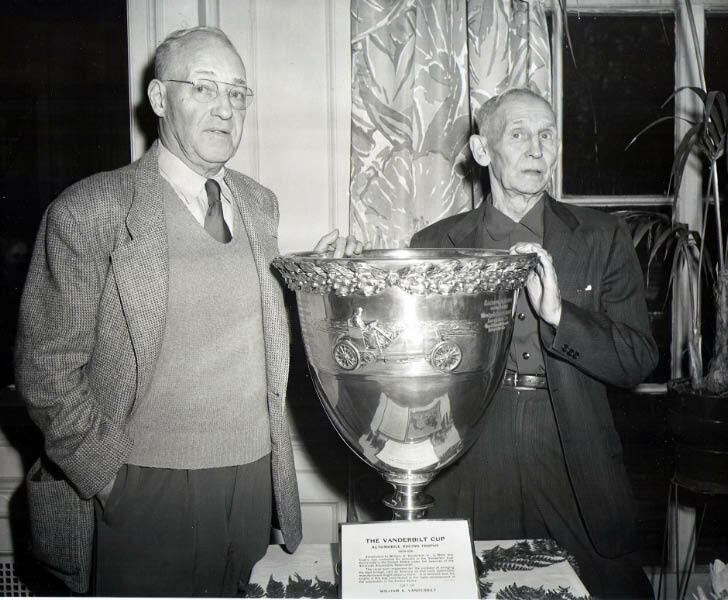 George Robertson (left) and Glenn Ethridge with the Vanderbilt Cup. My Guess. Old 16. Joe Tracy. 50th year anniversary of the 1908 VCR. Last time Joe Tracy sat behind the wheel of that car. It’s the 50th anniversary of the first Vanderbilt Cup Race and the last time the 1908 winning team would ever appear together. Robertson passed away shortly after. Car is the “Old 16” Locomobile. Photo taken at the 50th Anniversary of the 1st Vanderbilt Cup Race, held on Oct. 9, 1954 in Garden City. Significance is that this was the last time the winning team of the 1908 Cup Race, Robertson and Ethridge, appear together as Robertson passed away nine months later. Howard - will be sending you some articles about the event separately. 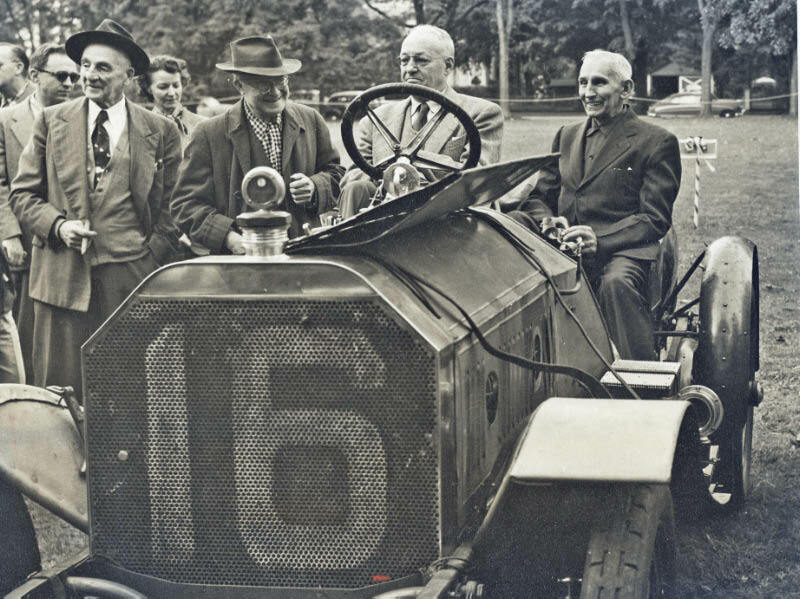 That looks like George Robertson and Glenn Ethridge, the winning team sitting in “Old 16”, the 1906 Locomobile they drove to victory in the 1908 Vanderbilt Cup Race. The photo was taken on October 9, 1954 at an event organized jointly by the L. I. Old Car Club and the Mineola Fair & Industrial Exposition to commemorate the 50th. anniversary of the first Vanderbilt Cup Race. Sadly, Robertson passed away 9 months later making this the last time he and Etheridge appeared together. 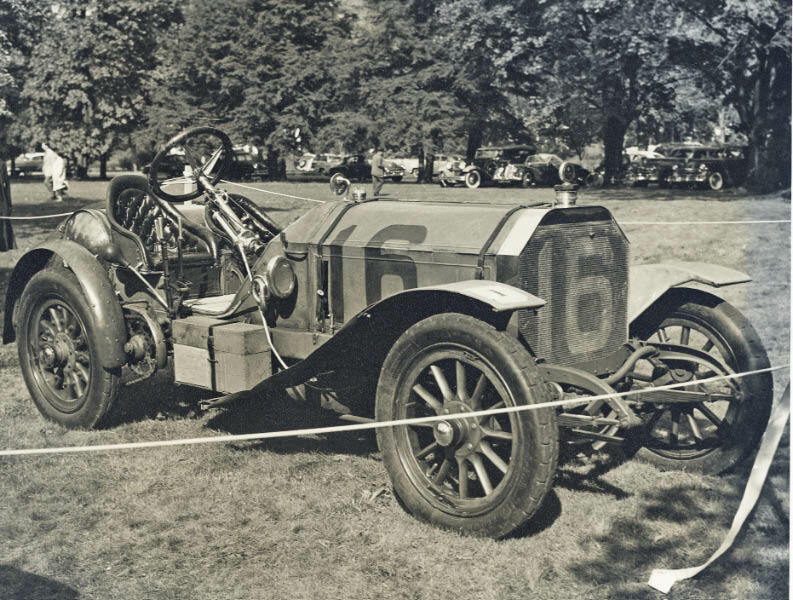 Looks like Peter Helck’s Locomobile. Tough mystery but here’s my go at it. Possibly a photo of a legendary driver (and wife), reunited with his legendary racer. 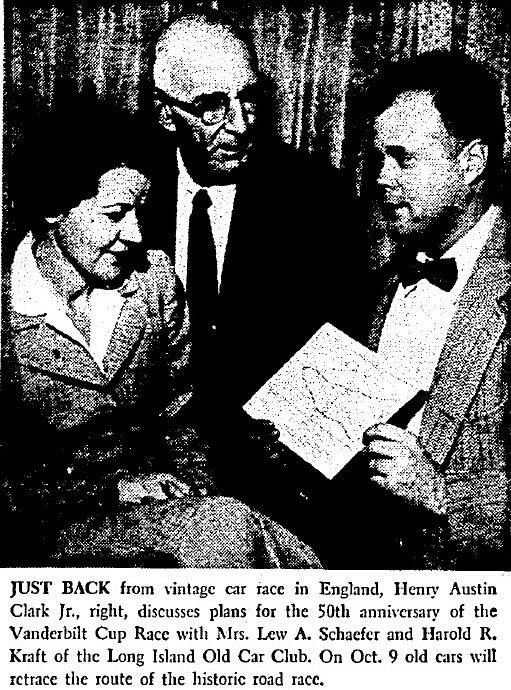 Mr. and Mrs. George Robertson appears at a car show on an unknown date.The driver sort of resembles an older Robertson (first time American winner in an American racer at the 1908 Vanderbilt Cup Race). This Old 16 racer? has wheel fenders where the VCR racer didn’t. Possibly installed later on. Sad ending to Robertson’s racing career in 1910. 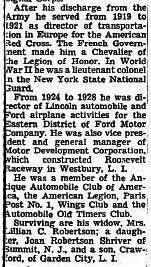 Where after being warned by his wife not to attend the race trials on that Friday the 13th because of a bad feeling, Robertson was attacked by a terrified news reporter doubling as a mechanician, causing Robertson to roll the racer over himself at the Massapequa turn resulting in permanent injuries to a broken arm. But the passenger also resembles the smaller build Glenn Ethridge (Mechanician). Not sure. We see of course the 1908 Locomobile VC winner. Behind the wheel George Robertson, beside him Glenn Ethridge, his former mechanician. The event is the 50th Anniversary of the first Vanderbilt Cup race, the date October 9, 1954. Glenn Ethridge would die a few months hereafter, so this is the last time the complete racing team was together. It is our famous Locomobile #16 and it may be at the re-enactment of the race in 1954 starting point Hitchcock Lane Westbury, just north of Jericho Turnpike.